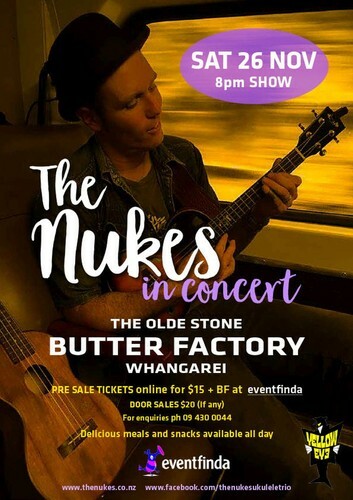 The Annual return to Whangarei and the Butter Factory this time with new material to showcase from the recently recorded 3rd album which is due for release in Feb / Mar 2017. Far more than a ukulele band. They are high entertainment. Part vaudeville, part rat-pack, part musical car crash. This talented trio delivers an engaging mix of humour and originality that audiences love. The innocent little uke is the instrument of choice and audiences will be staggered by what they are able to achieve with it. Great songwriting, musicianship and 3-part harmony combine to create a truly memorable experience. Rollicking and rolling out of the woolliest corners of Auckland’s wild west, it’s……. The Nukes, New Zealand’s most feared and revered original ukulele trio. Comprised of Dave “Fingers of fire” Parker, David “Snapper” Thiele and Benjamin “Country boy” Collier, The Nukes have a reputation for reckless and riveting live shows where a fine blend of folk, bluegrass, reggae and post-punk is caressed, coaxed and beaten out of three innocent wee ukuleles. As a child, founding member Dave Parker ran away from the circus in pursuit of a more regular life. He found it in the rather impressive combination of National pop celebrity and familial bliss, reaching the top of the charts with his bands The Parker Project and Rhythm cage whilst simultaneously reaching peak performance as a husband and father of four. However, after so many years of assumed normality, Dave began to feel the tug of his vaudevillian roots. In 2008 he could resist no longer, his will crumpled and…… The Nukes were formed. Rumour has it that David “Snapper” Thiele was born in the back seat of a half submerged Vauxhall Viva and raised by possums in the port hills around Christchurch. This would go someway to explaining some of his more obscure talents, unique dress sense and the fact that nobody knows his actual age. Snapper has led a life of enviable variety.. Sydney cab driver, performance artist, nudist, used car salesman, house re-piler, writer and radio host. In 2008 after suffering a series of near debilitating outbursts of musical violence, Snapper was informed by his Doctor Dave Parker that the only available and viable remedy was to join The Nukes. In the interest of his health and general public safety, Snapper complied. Like a lot of famous musicians, Ben Collier never graduated in his chosen field at a well respected tertiary institution. Unlike a lot of famous musicians, Ben is no art school flake, no law school dropout, he just never actually went to university. Instead, after a modest education in Beachhaven (considered by some to be the armpit of Auckland’s North shore) Ben spent time working in the magical world of television, and also playing drums for the widely adored New Zealand pop group Goldenhorse. This was followed by five years at a beachside meditation retreat where the only word allowed to be spoken was “parsley”. In an effort to recover from this trauma, Ben retired to the sprawling badlands of Woodhill where, like a great many deluded musicians, he found solace in the sweet twinkling tones of a ukulele. And so it was in 2008 that Dave Parker, on one of his many long distance tramping expeditions stumbled upon him, and resolved to restore him to a musically relevant condition as”Country boy”.